From Awkward To Art: Growing Up Is Hard (for Momma)! Growing Up Is Hard (for Momma)! The tears were definitely evident as I walked away. This may be the first time I cried dropping a kid off at their first day of school. Wes was excited and nervous. He explained it like this, "Kind of like when you go on a rollercoaster... and you know what I mean." Obviously, I do. I'm not sure why I cried. Maybe it's because of the new school thing. The boys gave him a high five when he was introduced so he seemed welcomed. I think it was mostly just looking at him and how old he looks with his new group of friends. I keep trying to avoid the fact that he is quickly creeping up on being a teenager. 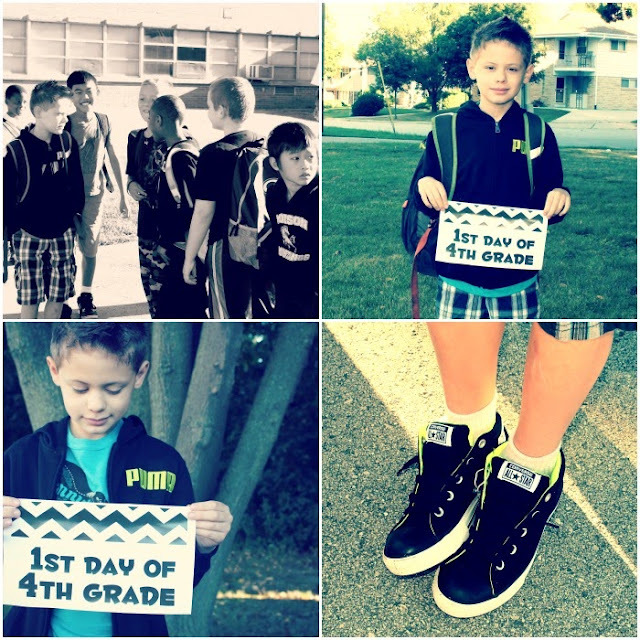 Or maybe I cried because he is finally able to wear normal clothes to school! No uniform! Yay! Haha! I love this kid so much. I layed with him for almost two hours last night trying to get him to fall asleep. Going to bed at 8pm is unreasonable after three months of going to be at eleven. But I promised him I would lay there and rub his back and I would NOT fall asleep before him. This is a common complaint with him. Tomorrow I do it all over again. Jada starts second grade and Leila starts her very first day of preschool. But I still can't wait.